Am I a cyborg now? Some time ago I've read about a guy that had a magnet implanted in the pinky finger. 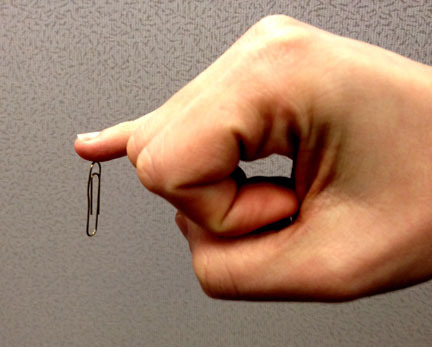 When people discuss magnet implants giving a “sixth sense,” this is what they’re talking about. I was working retail at the time, and I believe the first thing I noticed was the vibrations from the fan inside the cash register. The best part of having the magnet implant was discovering invisible magnetic fields when I wasn’t actually looking. The first experience I had with this was walking through the intersection of Broadway and Bleecker in Manhattan. I passed through this intersection a few times before realizing that my finger would tingle at a certain spot. After paying a bit more attention, I realized that I was feeling something underground. At first, I assumed it was a subway car, but later came to the conclusion that it was most likely the subway power generator, or the giant fan that was cooling these generator. Having a sixth sense sounds exciting, but implanting a piece of metal in your body is quite invasive. Even ignoring such details like finding a surgeon willing to perform the operation, the prospects of a possible magnet corrosion and not being able to get an MRI scan are major downsides. Deciding that an implant may not be for me I started to wonder: why not to try "emulate" the thing? Of course, any kind of "emulation" is inferior to real sensation in your finger, but at least I will be able to figure out if the whole idea is worthwhile without cutting myself. Devices that are used to detect magnetic fields are called magnetometers. 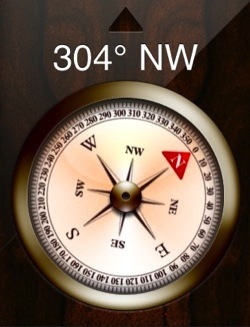 They are quite common spread - detecting magnetic field direction is exactly what compasses do. And most likely you have one in your phone. Having previously played with Arduino I thought about building a very simple device that could be worn and would notify the user about magnetic field fluctuations. From Dann's post I understand that he can only sense field fluctuations, but having a computer I'm able to detect more sophisticated changes in the field. I'm not an electrical engineer, even simple tasks like getting data from the magnetometer might be problematic in an Arduino world. 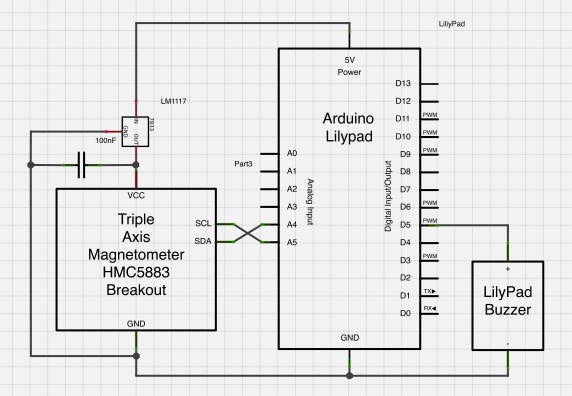 Luckily I found a blog post describing an Arduino talking to a simple magnetometer. The magnetometer unit in use is HMC6352. For $35 it's expensive - but at least it's very simple. The chip is simple, works with Arduino out of the box and accepts input voltage in a scale perfect for this project 2.7V - 5.2V. But unfortunately it was not good enough for my usage - readings from only two axis were inconsistent and I often missed interesting facts due to the lack of the third axis. The big problem with those chips is voltage - both operate in around 2V - 3.6V range (not the usual 5V as in USB). Wearing a normal Arduino Uno Board is not practical, fortunately there are many alternatives. I chose Arduino LilyPad Simple. On hindsight Arduino Fio or Pro Mini might have been better options. 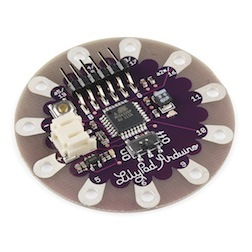 LilyPad can be powered with either from a Li-Po battery or from an USB (FTDI) interface. The latter is mostly useful for development. 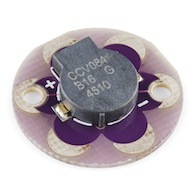 Most importantly - LilyPad does not provide a 3.3V power output like Uno Board does. 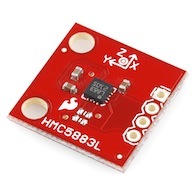 Our precious magnetometer HMC5883L will blow up when powered with 5V. In order to comprehend that I used a voltage regulator from LM1117 family. I got 3.3V one, as that was the only thing available in shop at a time. 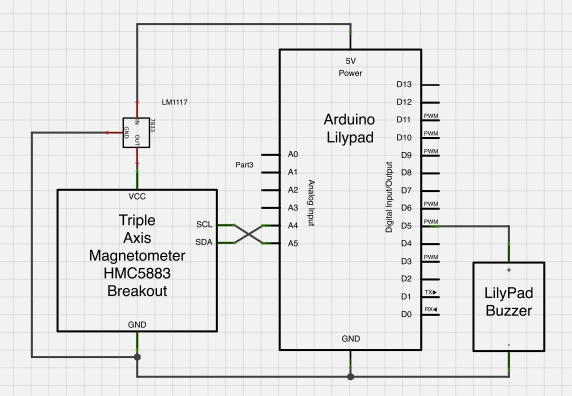 With a regulator used to power magnetometer I could connect it to LilyPad and power it either from Li-Po battery and from USB. Oh, it's worth noting that the regulator is useful even when using Li-Po battery as a power source - although the battery is rated as 3.7V, according to Wikipedia you should expect voltage ranging from 2.7V when discharged to 4.23V when charged. 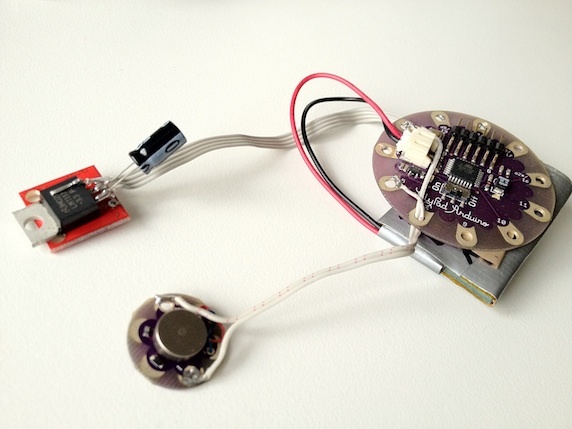 Sorting out the buzzer was simple - SparkFun provide ready-to-use buzzers crafted for LilyPad. Unfortunately this setup didn't work very well - once the buzzer was turned on, the magnetometer stopped working. This happened only when powered from battery (not from USB). The program for Arduino is available on my github (but don't expect high quality software). And that's basically it. In fact the program doesn't do much: continuously reads data from the magnetometer and if the strength of the magnetic field goes above the threshold it turns on the buzzer with proportional power. The threshold must be set quite carefully to cut off Earth's magnetic field, which is between 0.25 – 0.65 Gauss. I used the threshold of 0.7 Gauss. I wore the device for some time and it actually works. I quickly found out that the buzzer needs to be directly touching the skin to be felt. (Side note: wearing naked electronics may freak out people on the streets, I don't recommend that). 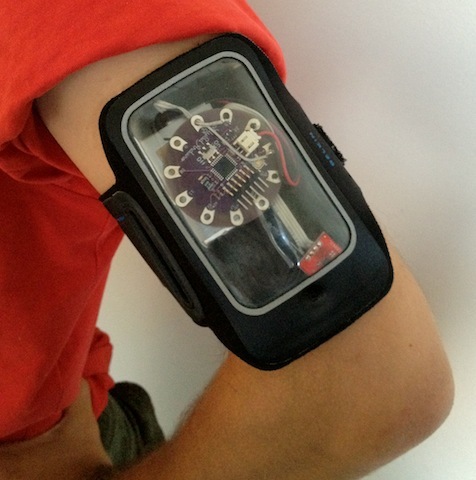 When wearing the device I could feel "stuff", mostly electrical devices. Friends were laughing at me when during a walk I was stopping suddenly and doing few steps back to identify the source of the magnetic field (it was usually a utility box). There were also places where I couldn't identify the source of the field. After all that, I agree that being able to feel the magnetic field is a great fun.